Kiwi fruit is native to China, and they posses lots of health and nutritional benefits. It is a fuzzy fruit with vibrant green interior and tiny black seeds. Kiwi was cultivated first commercially in New Zealand and was later introduced to the American markets. Traditionally in China, Kiwi fruit is used as medicine and given to women who just gave birth to a child and also to the newly born baby. Today, Kiwi is a very popular fruit because of its refreshing taste, and it is extensively used in many food items like salads and smoothies. Just like I stated before, the fruit has several health and nutritional benefits, e.g it is one of the richest source of vitamin C. A single cup of kiwi will give you nearly 275% of the amount of vitamin C you need on a daily basis. It also contains phytonutrients, vitamins and minerals, making it a fruit highly rich in nutrients. Below are some of the reason you need to eat kiwi fruits because of its health and nutritional benefits. Signs of aging, like wrinkles, will be a thing of the past once you start eating kiwi fruits. It also improves the health of your skin since it contains vitamin C and polysaccharides, which increases the production of collagen in the body. Collagen is the building block which is required to maintain skin, tendons and bones. Kiwi fruit is also enriched with antioxidant and carotenoid, which serves as protection to your skin from UV light and they are beneficial for the health of your skin. Kiwi is a good source of serotonin (a hormone which regulates and promotes good sleep). According to a research, eating kiwi fruits has shown to improve the quality of sleep and the total time of sleep. The fruit contains flavonoids like; catechin, epicatechin, quercitin and naringenin, which regulates the sleep inducing receptors. Since it is rich in fibre, kiwi fruits is also beneficial for intestinal health and digestion. It is a natural laxative, making it an excellent home remedy for constipation. 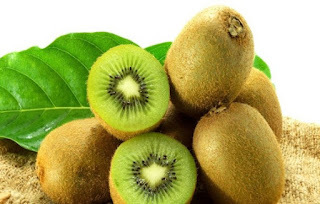 According to a study, the kiwi fruit contains proteolytic enzyme actinidin in a sufficient amount, and it improves protein digestion and bowel movement. According to a study conducted by Collins, Horska and Hotten, Kiwi fruits was found to contain a combination of antioxidants that protects DNA from the damage caused by oxidation. Extracts from Kiwi, protects the DNA from damage and inhibits the growth of cancerous cells. The fruit is cytotoxic to the cancerous cells but it does not affect the healthy cells. The presence of different types on antioxidants, vitamins and carotenoid makes kiwi fruit to be effective in healing and preventing cancers. Kiwi fruit contains lutein. Lutein is a powerful phytochemical which filters out the short wavelength UV light and protects the eyes. The fruit fights against many eye problems like age-related macular degeneration. It also a rich source of vitamin A, that improves the health of your eyes. Kiwi is anti-microbial and anti-fungal in nature, and it helps your body to fight off infection and diseases. It aids regulation of adaptive and innate immunity, which is important for staying healthy and disease-free. Eating kiwi fruits also reduces the symptoms of upper respiratory tract infections as well as cold and flu. Now you have known some health and nutritional benefits of kiwi fruits, it is high time you start including it in your diet. Pass the message on by sharing this post by using the share buttons below.